Here’s an interesting car. Let’s say you like diesels. And let’s say you also like performance. In general, these things are mutually exclusive. Most diesels are built for gas mileage, while most performance cars are built with the furthest engine possible from a diesel. Except for those Audis that race in LeMans. Those are an anomaly. But wouldn’t it be cool to combine diesel and performance? That’s precisely what VW did with the TDI Cup race series, an SCCA series that lasted from 2008 to 2011. 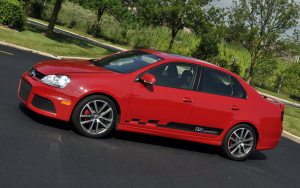 The cars that ran were all diesel-powered Jettas, just like the ones you could buy at the VW dealer, except that they had 170 horsepower, 270 pound-feet, and a roll cage. Also, they were covered in decals, but not from sponsors, because who the hell would watch diesel Jettas race? Anyway: eventually, VW decided to capitalize on the enormously minor success they had with this series by launching the TDI Cup Jetta. What a great strategy, right? Tune the standard car’s 140 horses and 236 lb-ft to the figures from the cup cars, and you have a touring car for the road. AND it has a diesel engine for fuel economy!!! HOW COOL! Only, Volkswagen didn’t tune the engine. 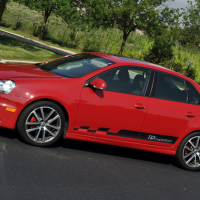 Instead, the Jetta TDI Cup was just a standard Jetta TDI, with the same 140 horses and the same 236 lb-ft. The only upgrades were a bodykit, some wheels, and what I can only imagine is a decal that says “TDI Cup Edition” while spanning both doors. So, the Jetta TDI Cup. It exists. But maybe it shouldn’t. Sigh…slow diesels. On a brighter note, I did enjoy the story and the colors of the cars. Huh, I had no idea these existed. I suppose that’s why you went with this title. I just did a search for them and turns out there’s one at a dealer near me. I wonder how hard it would be to tune one up to 170hp. You’re right, it makes no sense that these exist and that VW didn’t bump them up 30hp. I guess 170 is just too much for the street? Since its a VW turbo its gotta be a super easy upgrade. And a quick search confirms 170 HP is only a $600 APR chip away. And on my way to work this morning, I saw my first one in the wild. It passed me on my way to work. You must be some kind of see-er, Doug. I was really excited when VW announced this car. I thought the idea was that they dropped a TDI engine into the GLI? The decals are +15hp. Each. I sat in one of these at the dealership when my mother was considering moving from a Beetle Turbo S to a Sportwagen. It felt awfully cheap in comparison to those two cars. 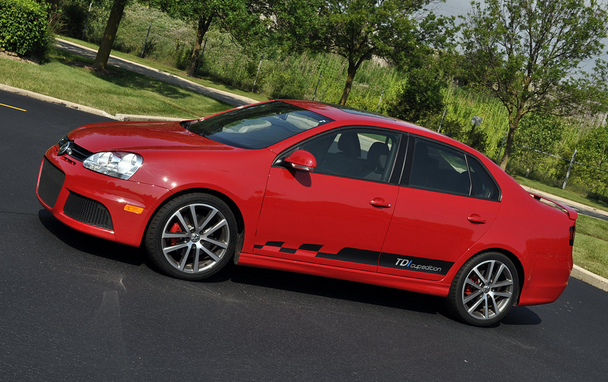 I’d consider a Golf TDI of that era over the Jetta TDI Cup edition.